Real Madrid had their first slip of the season last night at the Bernabéu, after drawing 2-2 against a well organized Valencia side. 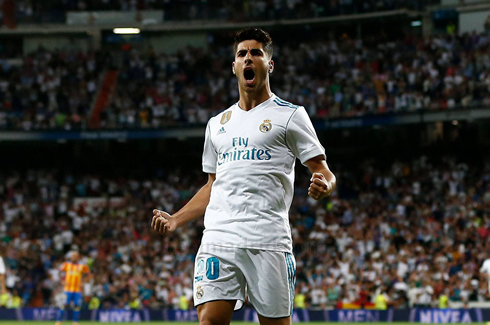 Marco Asensio scored the two goals for the Merengues, but there were many wasted chances to score several more that would have changed the story of this game. 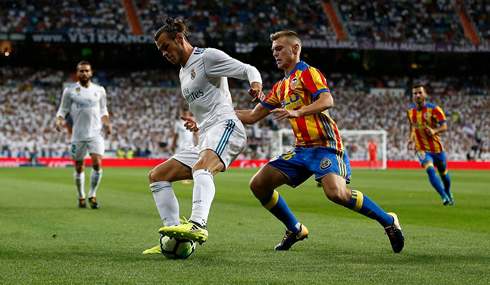 Real Madrid's cloak of invincibility came tumbling down tonight as the annual tradition of dropping points to Valencia reared its head tonight in a 2-2 home draw. It was a crazy match, to be honest, both sides playing end to end stuff and giving the Santiago Bernabéu a real show for their money. However, on the flipside, the Madrid fans have the right to be upset with the end result, despite the opponent they faced. And much of the blame will fall at the feet of Karim Benzema, who had an atrocious night in front of goal in Cristiano Ronaldo's absence. And it all got off to such a great start, with Real Madrid's man of the match Marco Asensio showing yet again why he should be a bonafide starter for this team. Taking the ball up in midfield after an errant pass, the 21-year-old sprinted towards goal and in trademark fashion, blasted his shot into the back of the net. However, Valencia were soon back in it, after Toni Lato and Jose Gaya teamed up to bamboozle Dani Carvajal on the wing. Gaya would eventually cross the ball into Carlos Soler and the midfielder would tap it in from just outside the six-yard box. A well-worked goal and the score was tied. 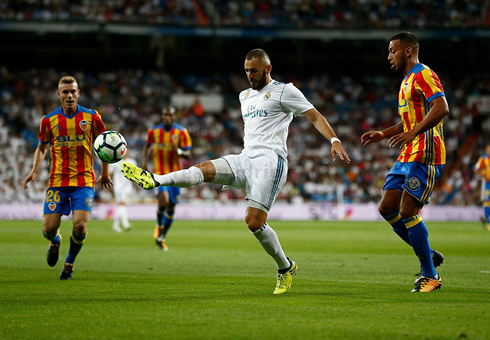 As the second half went on, the pressure built up and as Madrid pushed for a goal, Valencia found themselves with more and more free space to roam at the back. Los Che even took a shock lead later on from a neat finish by Geoffrey Kondogbia, on loan from Inter Milan. 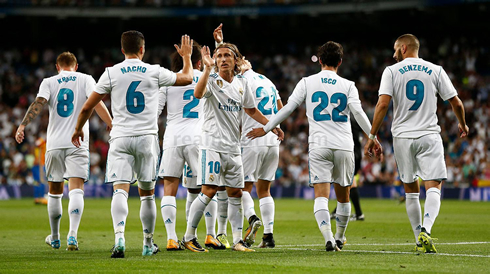 Thankfully, Asensio would net a tying freekick in the 83rd minute, to at least rescue a point for Real Madrid. As I mentioned above, the game lacked structure. With Casemiro deputizing for Varane, the midfield lacked bite and tactical nuance. Often times, Kroos and Isco neglected some of their defensive duties and Valencia were able to run free. But defensive woes aside, this game all came down to the poor performance by Karim Benzema in front of goal for Madrid. The Frenchman, lauded for his build up play, couldn't hit the back of the net at all today and missed a series of guilt-edged chances, as Madrid looked to put the game away. As the pressure mounted, he seemed to get poorer in front of goal, all culminating in a horrific miss in the 88th minute. Sadly, the two B's in the BBC have been losing prominence in Madrid for a while now and it's getting harder to see why both Benzema and Bale deserve a place in the first 11, while the likes of Isco and Asensio are playing so well. It's fine for now, but when Ronaldo returns, at least one of those two have to hit the bench more consistently. The BBC is done, but the "C" has a long way to go. Perhaps we'll be looking at the C (Cristiano), I (Isco) A (Asensio) sooner rather than later. Cristiano Ronaldo next game is for Portugal on August 31 of 2017 against the Faroe Islands. You can watch Juventus live stream, Portugal vs Faroe Islands, Uruguay vs Argentina, Malta vs England, Brazil vs Ecuador, and Czech Republic vs Germany, all matches provided from our football streams game pages.